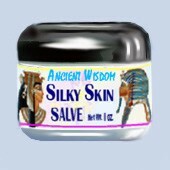 Externally: Gently rub the "Silky Skin Salve" on the skin once, twice or as many times as you wish, daily. Note: The healthy diet and detoxification is highly recommended for healthy looking skin. sun burns, pimples, blemishes, black heads, wrinkles, scars, damaged skin, blisters, etc. Rejuvenating and enriching one of the kind - the best your skin can get topically. Very delicate can be used on babies and kids. Note: The longer it has been stored in the dry cool place, the healing properties increase, the "Silky Skin" salve becomes more potent. Silky Skin Salve is prepared in accordance with the Ancient Formulae. It is 100% pure herbal and Bee Products combination with no colors, no preservatives, no chemicals added. Ingredients: Propolis, Honey, Royal Jelly, St.John’s Wort Flower Oil, Abis balsamea Oil, Bee Pollen, Distilled Water, Honey Bee Capping.